Creature Conflict is a blend of turn-based tactical and real time action/arcade elements. In this case, however, the battlefields are not 2D landscapes, but completely 3D mini-planets. 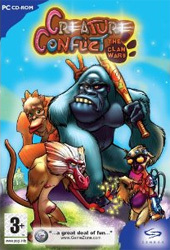 The main idea is simple: 2-4 teams of animals (controlled by either human players or the computer) take it in turns as they try to destroy the enemy teams. Each player is in command of 1 to 8 animals. The teams may consist of various units. The player’s task is to put together his group, equip the fighters, and place them on the scene of the battle – the planet. When each of the players has done so, the fight starts. The player has to make tactical decisions on what to do, and with which unit(s). Once he has made up his mind, he takes control of his first unit, selects the weapon he finds suitable for the task and carries out the planned move personally. In the meantime, the gamer has to pay attention not to exceed the turn’s time limit, although in Free Shot Mode he can control several of his units during a turn (one after another), which gives him the opportunity to perform various cooperative actions. The game is laden with well-know arcade elements (moving platforms, sinking blocks etc.) that further increase the challenge and fun factor of the game.